Mission’s Karolyna Buck accepts an award from Steve Woll for winning the girls' three-point competition. Area teammates work together with their former competition. 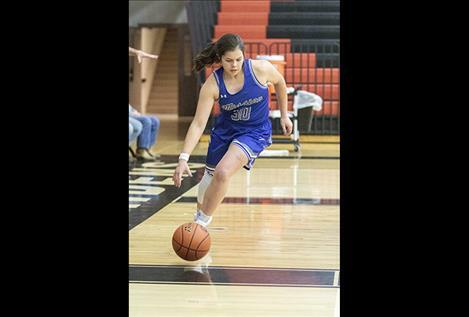 Outstanding athletes from area high schools joined forces for the 24th annual All-Star basketball game, held Thursday evening at the Ronan Event Center, top. There was some fast-paced hardwood action as the 2018-2019 high school basketball season officially came to a close in the Mission Valley on Thursday evening at the Ronan Event Center. 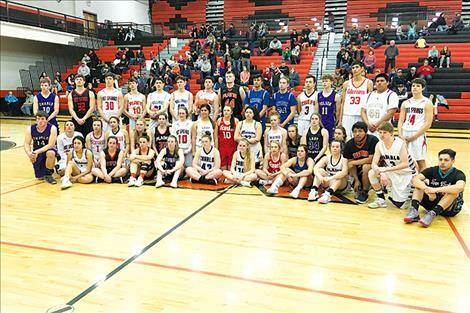 Forty-two players from across the valley were given the opportunity to put on their school jerseys and play one last time in front of their family, friends and fans during the 24th annual All-Star event. This year’s event was renamed the Les Rice Memorial All-Star game in honor and celebration of legendary Mission basketball coach Les Rice. The boys' and girls’ games were college-length with four 10-minute quarters as opposed to four eight-minute quarters, which comprise high school games. The players were divided into two teams. Team A (light-jerseys and called the home team) and Team B (dark-colored jerseys or guest team) were both made up of valley talent who had played in this year’s state title games as well as several others who led their teams into the playoffs. The girls’ game was a close one, but in the end, Team A narrowly escaped with a 65-64 win. Team A’s 61-51 lead at the 4:46 mark in the fourth quarter started to dwindle as Team B went on a 13-4 scoring rally. Ronan Maiden Jaylea Lunceford gave Team B a 64-62 lead with just under a minute left in the game; however, Team A scored the last three points of the game at the charity stripe to give them the win. Ansleigh Edgerton of Bigfork, who scored a team-high 18 points, was voted Team A MVP after Thursday night’s game. Team A also received solid efforts from Charlo’s Kaitlyn Cox (six points), Charlo’s Allie Delaney (two points), Mission’s Karolyna Buck (nine points), Ronan’s Tiana Ulutoa (12 points), Polson’s Olivia Perez (one point), Hot Springs’ McKennzie Cannon (three points), Arlee’s Noelle West (two points), Hot Springs’ Katelyn Christensen (six points), Plains’ Natalee Deschamps (four points) and Mission’s Addison Arlint (two points). Team B MVP winner Mission’s Azia Umphrey said, “It was a blast” to be able to play in the game. 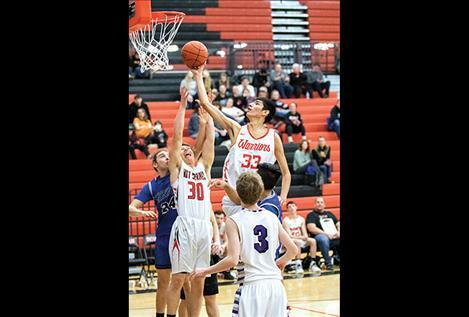 Umphrey scored a team-high 18 points, including two three-pointers. Other key contributors for Team B were Charlo’s Teaira Truman (five points), Polson’s Karly Lawson (six points), Plains’ Kassidy Kinzie (four points), Arlee’s Nellie Desjarlais (seven points), Ronan’s Jaylea Lunceford (12 points), Bigfork’s Rakiah Grende (two points), Arlee’s Emily Fiddler (two points), Hot Springs’ Sydney Jackson (six points), Plains’ Rachel Huenink (two points) and Mission’s Sydney Brander. The boys' game was not as close of an affair as the girls’ game. Team B took a 54-47 half-time lead into the locker room, but it was Team A who prevailed in the end with a score of 94-86. 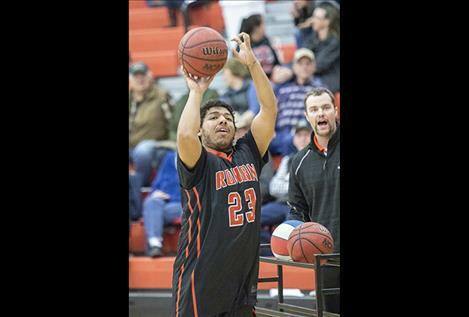 Arlee’s Isaac Fisher ended his high school basketball career in the best way possible: he threw down two dunks and drained a three-pointer to lead all scorers with 23 points. Fisher also walked away with Team A MVP honors. “Out here with all my friends, playing in the game we all love, it was really awesome,” Fisher said. Team A’s other leading players were Mission’s Wacey McClure (17 points), Plains’ Treydon Brouillette (10 points) and Plains’ Matt McCracken (10 points). Other Team A contributors were Hot Springs’ Brandon Knutson (seven points), Polson’s Micah Askan (six points), Mission’s Flint McPherson (seven points), Ronan’s Randy Finley (five points), Hot Springs’ Tyler Carr (four points) and Connor Koenig (five points). 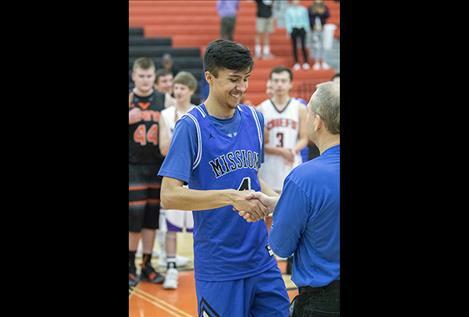 For the second year in a row, Mission Bulldogs’ Jacob Hugs won MVP honors. Hugs was one of three Team B members who scored 12 points during the game. Team B’s other top players were Charlo’s Landers Smith (12 points), Mission’s Jedi Christy (12 points) and Two Eagle River School’s Travis Pierre who sank four three-pointers for a team-high 13 points. Area boys playing for Team B were Arlee’s Cody Tanner (six points), Hot Spring’s Tyler Knudsen (eight points), Charlo’s Garett Vaughn (two points), Polson’s Robin Erickson (two points), Ronan’s Bubba Bush (three points), Arlee’s Lane Johnson and Plains’ Derick Curry (nine points). The Les Rice Memorial All-Star game also featured a three-point skills competition. Ronan’s Bubba Bush won the boys’ competition, while Mission’s Karolyna Buck made the most three-pointers to win the girls’ title.